When cleaning out the family home, we sometimes find pieces from the past that relate closely to our current life. 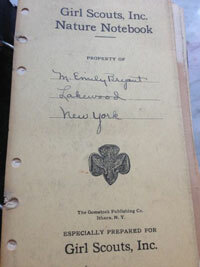 My grandmother’s Girl Scout Inc. Nature Notebook from 1925 (stored in an antique stationery desk all of her and my mother’s adult life) made its way into my hands and heart today. “What would you like to do with this?” Barb asked. After holding and reading through it for several minutes, I decided I’d like to keep it in the stationery desk, alongside the nature notebooks we are keeping now to track wildlife sightings on our property and sketch our wheelchair-accessible garden designs. This small notebook includes outlines for bird observation and tree study along with great line-drawings of birds and trees. Between the pages are dried leafs – from 1927? I wonder… some of the entries in the book are dated 1927. It is a wonderful highlight of this summer’s experience to discover ancient treasures that hold so much meaning for my present path. The past, present, and future are connected and experienced as one in the now. Estate Management Tip: Keep and open mind and heart as you go through the family home and hearth. The spirits of our ancestors are often with us, as the heart of who they were is often left behind for us to open up.